Hi, I'm Marlee! Natalie and I have been friends since we were really little. I like to take charge of things, and usually get along with everybody. I have an older brother named Pete and a younger brother named Jake. They're normally great, but sometimes they drive me crazy! I love riding my horse, Picasso. I also like to write in my journal and do art projects. One of my favorite things is to create my own look with funky outfits. Like Marlee, my Crunchy has a big brother and a little brother who are "normally great, but sometimes they drive (her) crazy". Crunchy loves to draw and is known for putting together some pretty interesting outfits! 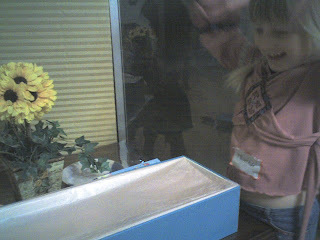 Crunchy's first look at the doll. After my post about toy packaging, I had to show you how these dolls are attached to the box. No plastic ties to untwist or tags to cut off. At each hand, the feet, the torso, and the neck, there was a ribbon tied in a pretty bow. It was so easy (and pretty!) to get it out of the box! "Let me check you out!" I love my doll! It is pretty. I love it. I love it so much. I wish every little girl in the world had one. Marlee means so much to me. It's like a dream come true. I like the Butterfly Promises too. If I could meet her (Kristi, founder) I would probably faint! The craftsmanship of these dolls is incredible. The dolls are 18 inches tall, have a vinyl body, moveable arms and legs, and are able to stand on their own. Friends Forever Girls started when founder, Kristi Necochea, looked for a high quality doll for her daughter that was fun to play with, that was dressed in hip but age-appropriate clothes, and that could be used as a tool to help build self-respect and foster responsibility. When she didn't find one, she decided to create her own line of dolls. I'd like to thank MomBlog Marketing for this opportunity! Visit Friends Forever Girls to learn more. You can meet the Girls here. When you shop use with the code: "Spring" and you will receive a free t-shirt with any doll purchase (while supplies last) This is a $14.99 value! That's right! I get to give one away! (Sorry, I can't do like Crunchy suggested and give one to every little girl!) The winner will be able to choose any doll from the site! ($59 value!). Sorry, limited to the Continental US. OhMiGosh... Boug would love this!! 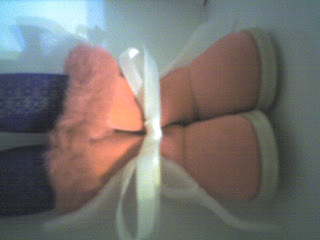 Wow these are gorgeous; i had never heard of this brand before! These dolls are really cool. I went to the site to check them out and Nika is perfect for my DD. I wish every little girl could have one too! These dolls are really cute! my tot would love one! I have an 8 year old who would LOVE this !!! wow would love to win the beautiful doll for my daughter. It cute as can be!!!! LKove to win this prize. I would love to win one of these dolls for my niece. Thanks fro the chance. I think these dolls are wonderful. I just love all the extra clothes you can get for them. I like that they are kind of pre-teen dolls too. I know my Little Miss neice would love this doll, thanks for sharing! I would love the Nika doll for my daughter it looks just like my Erin!! I would love to win the Marlee doll for my granddaughter. She and I could practice the "Pledge", which is based on the "Butterfly" Promises. I wish there were more companies like Friends Forever girl's book series and collection of life-looking dolls, to teach children the importance of friendship, character, respect and community and self-image improvement. Kyleen sounds like the perfect match for my little girl ! Wow, these dolls are amazing! My favorite is the Natalie doll. Thanks for the giveaway. don't you love a girl with a giving heart? My daughter was born in Guatemala and I am always looking for Hispanic dolls that will teach her solid values. This looks like a great company, thanks for introducing me. I subscribed to your blog (google reader). I'm a Mama and I still love dolls. I love the Nika doll......she is so beautiful. I love their way of thinking. "The idea of giving back is at the core of our business philosophy. Our goal is to model a set of core values that inspires young girls and we hope that our ongoing Get Up & Give! campaign will show them that even a small contribution can make a difference." I adored seeing the photos of your little girl's face in the post. I loved dolls growing up. 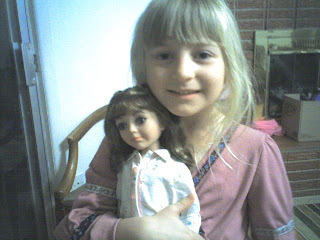 I'll never forget the day I got Samantha, the American Girl doll! I will treasure that feeling always in my heart. :) I just started blogging and am loving it! You have an awesome blog and I am looking forward to browsing around your site. Thank you for participating in a giveaway...how fun! What a great giveaway! These dolls are beautiful. Thanks for the opportunity to win I will keep my fingers crossed. Dolls with a positive message. Can't go wrong with that. My daughter would cherish the opportunity to own one. Thanks for a great giveaway! Finding a doll that is special enough for your little girl is not as easy as one might think! I think maybe you have found her? I like the fact that these dolls are dressed modestly. Any of my girls would love this! It's almost like an American doll, only cheaper. HMMM???? Have to keep my eyes on this as the holidays roll around. I follow your blog :) I forgot to post this extra comment the other day when I put my original comment. I would really really love to win the Nika doll for my younger sisters!!! This would be perfect for them as they are having a hard time in their family right now! The Natalie doll would be perfect for my granddaughter! My 6 year old daughter would love any of these dolls as a friend to her doll!! 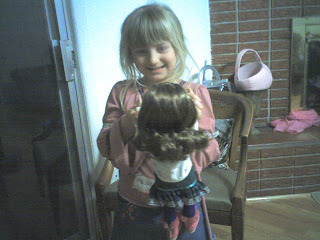 I'd love to win the Natalie doll for my 6 year old named Natalie. These are such beautiful dolls. I'd sure love to win one for the kiddo! This is a very generous giveaway. Thanks for sponsoring it. Very pretty dolls. THe look on your daughters face says it all.